Meets regularly to manage programs and activities and sets the overall direction for the center. Will meet once or twice per year to discuss areas of need, suggest new programs and activities, and assist center in achieving it goals and mission. The EAB includes partners and organizations that are interested in the educational activities of the center, including the MS in Predictive Analytics, certificate programs, and educational/training workshops. Members of the EAB have sponsored at least one real-world student project. EAB specific goals include providing guidance on the MS in Predictive Analytics curriculum and other specialized training and workshops, providing support for internship programs or other training opportunities for students. Meets as needed and reports to the Center Advisory Board and the Center Leadership Group. The Research Innovation Board (RIB) will include the leadership group, selected faculty and industry experts, and representatives from major partners. Decides how and what portion of funds received from industry partners or other potential funding sources will be used to develop a Research Innovation Fund. 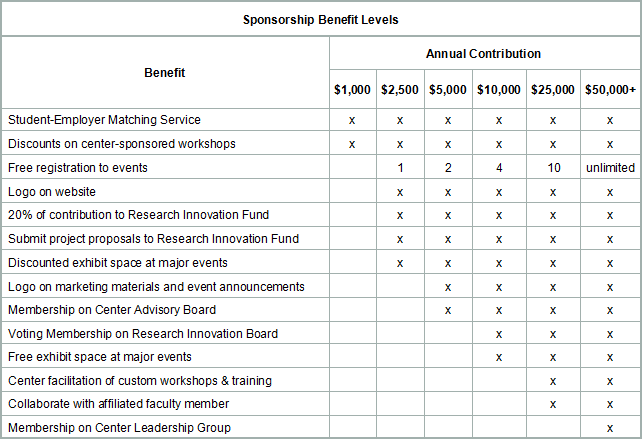 Partners (at $2,500 or above) or affiliated faculty members can submit project proposals to the fund. Selects projects may be partially funded, and the center facilitates support for the selected projects through its affiliated faculty and other industry partners. The RIB will meet twice a year to review and recommend project proposals, set funding and support priorities, and assist in matching resources with selected projects. For more information on how to become a partner, please contact Professor Daniela Raicu.